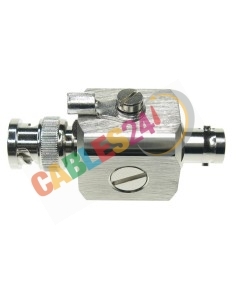 Shop Online Cables24 RF Surge Protectors coaxial 75 ohms. RF Surge protectors (also known as transient suppressors) from cables24.com are manufactured in accordance with strict RF standards for protection against overvoltages. This RF protector has a compact inline design and 75 ohm impedance. Our surge protectors have low insertion loss, return and low passive intermodulation (PIM) level. They have replaceable gas dischargers and a connection terminal that allows an excellent connection to earth. 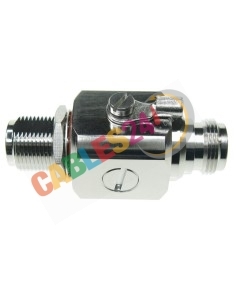 They are available with gas discharge valves of 90, 145, 230, 350, 470 ± 20% volts. Surge protectors / transient suppressors from cables24.com are commonly used in installations with antennas to protect sensitive equipment and are specially designed to let the desired frequencies pass while eliminating overvoltages. Radio communication systems that are connected to an antenna are especially exposed to lightning. The biggest danger is that a lightning stripe directly reaches the antenna. Equipment such as GMS / UMTS or TETRA base stations must be protected against this risk to ensure continuity of service. Overvoltage protectors are available in a wide range of types and configurations for 2G, 3G, 4G, LTE, Wifi, WiMAX, FM, AM, VHF and UHF transmission applications. RF Surge Protector 75 Ohms There are 2 products.